Uthman is remembered as a pious, gentle, and kind man, known for his modesty and shyness, and admired for his generosity. Uthman ibn Affan (may Allah be pleased with him) was the third of Prophet Muhammad’s successors. He was known as the leader of the faithful and ruled for approximately 12 years. The first six years were times of relative tranquillity and peace, however the last years of his reign were marred by internal conflict, and pockets of rebels trying to cause havoc throughout the Caliphate. Uthman, may God be pleased with him, was born seven years after Prophet Muhammad, may the mercy and blessings of God be upon him, and belonged to the Umayyad branch of the Quraish tribe. The Umayyads were the most influential clan of the Quraish, they were the strongest and wealthiest, and Uthman (may Allah be pleased with him) was their “golden child”, the most beloved, due to his good manners and shyness. Like his predecessor Umar ibn Al Khattab (may Allah be pleased with him), Uthman (may Allah be pleased with him) was able to read and write. This was an unusual skill in pre Islamic Arabia and Uthman (may Allah be pleased with him) became a successful trader and cloth merchant. Throughout his life he was known as a kind, generous man and even before his conversion to Islam he would freely give money to help those in need. It was his close friend Abu Bakr(may Allah be pleased with him) who introduced Uthman (may Allah be pleased with him) to Islam and he embraced the new religion at the age of thirty-four. This was during the very early days of Islam when the men of Mecca were systematically abusing and torturing any converts to Islam. In spite of the abuse, Uthman (may Allah be pleased with him) would not give up his Islam and in time Uthman(may Allah be pleased with him) was married to Prophet Muhammad’s daughter, Ruqiayah, thus strengthening his relationship to the Prophet (peace and blessings be upon him). The abuse and torture continued and Uthman’s wealthy family and status in society as a merchant did not protect him. He was abused and tortured even by members of his own family; his uncle shackled his hands and feet and shut him in a dark enclosed room. The continual bad treatment by his close family led Uthman and his wife to participate in the first migration to Abyssinia. Prophet Muhammad (peace and blessings be upon him) praised his forbearing character and said “After Lot, Uthman is the first man who, with his wife, has given up the comfort of his home for the sake of Allah”. After some time Uthman and Ruqiayah (may Allah be pleased with them) returned to Mecca to be with the struggling Muslims and their beloved father and Prophet (peace and blessings be upon him). Uthman (may Allah be pleased with him) formed a very close relationship with Prophet Muhammad (peace and blessings be upon him), and he gained intricate knowledge about the religion of Islam. He (may Allah be pleased with him) narrated 146 traditions directly from the Prophet (peace and blessings be upon him) himself and was one of very few people who were able to write down Quran. Uthman (may Allah be pleased with him) also became a reference point for those trying to learn the rituals of worship. He understood and was able to instruct others in the rituals of ablution, prayer, and other Islamic obligations. Uthman (may Allah be pleased with him) also participated in the migration to Medina and here he assisted Prophet Muhammad (peace and blessings be upon him)in establishing the Muslim nation. Prophet Muhammad (peace and blessings be upon him) even referred to him as his assistant. In Medina, water was scarce and control of the wells was tightly held by several men. Because he was a skilful trader and negotiator, Uthman (may Allah be pleased with him) set about trying to procure a well for the use of the Muslims. He negotiated a price for half a well; he would have control one day and the other owner the next day. However, Uthman(may Allah be pleased with him) gave his water to the Muslims freely, so nobody wanted to pay for the water on the alternate days. The original owner of the well had no choice but to sell his half of the well to Uthman (may Allah be pleased with him) who nevertheless paid a fair price for it. Uthman (may Allah be pleased with him) continued to allow the water to be used freely by all and never reminded the people of his charity. He was humble and modest. Uthman (may Allah be pleased with him) gave freely from his wealth to please Allah and His messenger Muhammad. Historical Islamic stories mention that every Friday Uthman (may Allah be pleased with him) would buy slaves for the purpose of setting them free and that although he was wealthy he was often without servants because of this habit. When Prophet Muhammad (peace and blessings be upon him)and the Muslim armies were going to fight the Byzantines at Tabuk, he called on the wealthier people to give from their wealth and property to support and equip the soldiers. Uthman (may Allah be pleased with him) presented 200 saddled camels and 200 ounces of gold. He (may Allah be pleased with him) also gave 1,000 dinars. Prophet Muhammad (peace and blessings be upon him)kept asking for donations hoping to inspire others to give as freely as Uthman. However, it was Uthman (may Allah be pleased with him) who surpassed them all and gave a total of 900 equipped camels. The portrait we are able to build of Uthman (may Allah be pleased with him) is that of a generous, unassuming, and kind man. He was known for his humbleness, modesty, and piety. Uthman (may Allah be pleased with him) would often spend the nights in prayer and he was known to fast often, sometimes on alternative days. In spite of his wealth, he lived simply and would often sleep, wrapped in a blanket, on the sand of the mosque. Uthman (may Allah be pleased with him) was appointed as the third leader of the Muslims after Prophet Muhammad (peace and blessings be upon him) by a council of six men. He continued the humane and just rule of Prophet Muhammad (peace and blessings be upon him), Abu Bakr, and Omar (may Allah be pleased with them). He (may Allah be pleased with him) cared for the Muslims and expanded the Muslim Caliphate into Morocco, Afghanistan, and Azerbaijan. For six years, his reign was one of peace and calmness, but the winds of change were blowing over the empire. Uthman ibn Affan (may Allah be pleased with him), like his predecessors was a man of the people. He was modest, shy, and humble but still his later reign was marred by infighting and rebellion. Allh had chosen Uthman (may Allah be pleased with him) to be the third leader but the people of dissension plotted to remove him from this noble position. Prophet Muhammad (peace and blessings be upon him) had prophesized that Uthman (may Allah be pleased with him) would be placed in a very difficult situation when he said, “Perhaps Allah will clothe you with a shirt, Uthman, and if the people want you to take it off, do not take it off for them.” Uthman (may Allah be pleased with him) did not remove his shirt, his love for Allah and His Messenger (peace and blessings be upon him) kept him both strong and humble in the face of old age and extreme difficulties. Uthman ibn Affan (may Allah be pleased with him) was a man so loved by Prophet Muhammad, may the mercy and blessings of Allah be upon him, that he was called the possessor of two lights. Uthman (may Allah be pleased with him) was married to Prophet Muhammad’s daughter Ruqiayah and when she died, he married Muhammad’s other daughter, Umm Kulthum, thus possessing the two lights. Uthman ibn Affan (may Allah be pleased with him) was appointed Caliph (leader of the Muslim nation) through a process of consultation and careful deliberation. On his deathbed, Umar ibn Al Khattab (may Allah be pleased with him) appointed a council of six men to choose a new leader. It was a time of confusion and chaos for the Muslims, small disagreements were becoming obstacles. 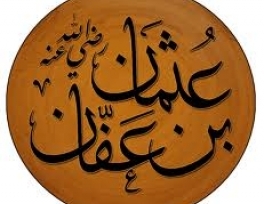 Some people wanted to appoint Ali ibn Abu Talib (may Allah be pleased with him) because he was from Prophet Muhammad’s family, others wanted to appoint Uthman (may Allah be pleased with him) because he was from one of the great tribes of Mecca. Ibn Kathir, the respected Islamic scholar of the 14th century suggests that the leader of the council, Abdu Rahman ibn Awf questioned both men and then chose Uthman. Abdurrahman asked Ali, “Do you swear to rule by the glorious book of God (Quran) and the Sunnah (traditions) of His messenger?” To which he replied, “I hope to act according to my best knowledge and capacity”. When Abdurrahman asked Uthman (may Allah be pleased with them) the same question, he replied simply, “I do”. It would be too simplistic to suggest that the decision was made solely by the answer to this question but rather it was part of a process of reflection and deliberation. Both men were amongst several who were eminently qualified to lead the Muslim nation. Uthman (may Allah be pleased with him) was a man known to be pious, generous, and modest, perhaps his simple answer reflected his personality. A shy man, who spoke few words but whose heart was filled with love for God and His messenger. Immediately after being elected, Uthman ibn Affan (may Allah be pleased with him) addressed the people from the minbar previously used by Prophet Muhammad (peace and blessings be upon him). He looked at the Muslims and praised Allah, sent blessings upon Prophet Muhammad (peace and blessings be upon him), and reminded the people that this world was full of deception. He advised the people to shun living luxurious lives and to seek a place in the hereafter, full of happiness and peace. Uthman (may Allah be pleased with him) was a pious man who loved and trusted God completely, thus his first action as leader was to assure the people that he would guide them according to the way of the Prophet and Caliphs Abu Bakr and Umar ibn Al Khattab (may Allah be pleased with them). Uthman (may Allah be pleased with him) was turning 70 when he became leader of the Muslims and for many years, he had refrained from the pleasures of this life in order to seek nearness to Allah. After setting a tone of piety and concern for Muslims that would be the hallmark of his reign, Uthman (may Allah be pleased with him) turned his attention to giving direction to the governors and the Muslim armies. To the governors Uthman (may Allah be pleased with him) expressed his desire for them to serve the people, and never to exploit them. He sent prominent companions of Prophet Muhammad (peace and blessings be upon him), as his personal deputies to the provinces to scrutinize the conduct of officials and the condition of the people. Uthman (may Allah be pleased with him) reminded the armies to follow the clear guidelines set down by Umar ibn Al Khattab (may Allah be pleased with him) and asked them never to forget that they were defending the believers. Extensive conquests were made during the reign of Uthman, including parts of Spain, Morocco, and Afghanistan. Uthman (may Allah be pleased with him) was also the first Caliph to organise a navy. He (may Allah be pleased with him) reorganised the administrative divisions of the Muslim Caliphate, expanded, and initiated many public projects. Perhaps Uthman’s most astounding contribution to the Muslims was his compilation of the Quran. After the death of Prophet Muhammad (peace and blessings be upon him), and during the time of the Caliphs, hundreds of thousands of non-Arabs converted to Islam. Consequently, the Quran began to be recited and written in various different dialects and scripts. One of Prophet Mohammad’s companions, and Uthman’s friend Hudhaifah, whilst on a journey noticed that there were many different recitations of Quran throughout the Muslim Empire. Hudhaifah suggested to Uthman that there be an official version written in the style used in Medina. Uthman (may Allah be pleased with him) knew the Quran by heart and had intimate knowledge of the context and circumstances relating to each verse. 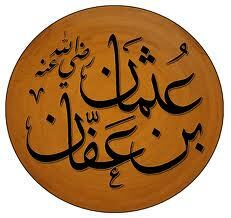 The Quran had been gathered during the time of Abu Bakr and was in the safekeeping of Prophet Muhammad’s wife Hafsah. Uthman (may Allah be pleased with him) took possession of the originals and ordered some of the most trusted companions to make careful copies. He then ordered all other unofficial copies to be burned or otherwise destroyed. Five official copies were sent to the greatest cities of the Muslim Caliphate. Original copies exist to this day in Tashkent, Uzbekistan and the Topkapi Palace in Istanbul, Turkey. Uthman (may Allah be pleased with him) remained true to his covenant but after a long siege, the rebels broke into his house and murdered him. As the assassin’s sword struck, Uthman (may Allah be pleased with him) was reciting the following verse. Such was the tragic end of one of the most pious, kind and selfless men in Islam.